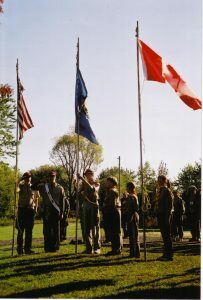 The World Brotherhood Camporee is an annual event held every September with up to 3,000 attendees from Canadian and American Scout Troops. Each year the Loyalist Area, Scouts Canada and the Longhouse Council, BSA take turns hosting this camporee. In the even numbered years, it’s held in the USA at Wellesley Island State Park (in the Thousand Islands across from Clayton, NY). In the odd numbered years it’s held in Canada at Riverside Cedar Campground (near Morrisburg, ON). The program varies from camporee to camporee but the one big constant is crest and patch trading. When hosted by the Loyalist Area, proceeds from the camp help support projects of the Canadian Scout Brotherhood Fund.